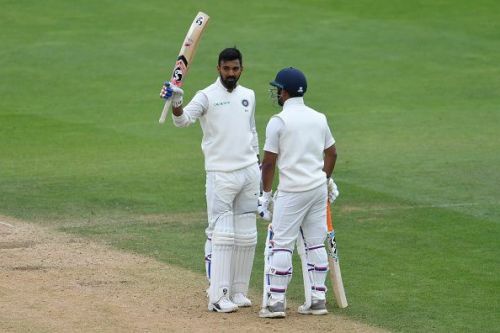 London, Sep 11 (PTI) KL Rahul finally did justice to his immense talent as his belligerent century took India to 167 for 5 against England at lunch in pursuit of a mammoth 464 on the final day of the fifth Test. Rahul smashed an unbeaten 108 off 126 balls with the help of 17 boundaries and a six off Ben Stokes while England struck twin blows towards the end of the session to remain on course for a 4-1 series victory. This is his fifth Test hundred and first 50 plus score of the series after failing in nine successive innings. Rahul added 118 runs for the fourth wicket with vice-captain Ajinkya Rahane (37, 106 balls) before an indiscreet paddle sweep off Moeen Ali brought about the latter's downfall. Hanuma Vihari (0) didn't have the luck of the first innings as Ben Stokes got him to nick one to Jonny Bairstow behind the stumps. Starting from overnight 58/3, Rahul and his fourth-wicket partner Ajinkya Rahane (37) looked to play for time. Thanks to the heavy roller, the wicket wasn't doing too much again as in the first four morning sessions. Despite a few plays and misses, the duo was able to see off the first hour of play without any trouble, adding 39 runs. Rahul reached 50 off 57 balls. Growing in confidence, they started playing a few more shots, especially against Moeen Ali (1-47). Rahul survived a hairy moment in the 32nd over, when an lbw shout via DRS review was turned down. They took India past 150 in the 41st over with their 100-partnership coming off 179 balls, thus raising vision of a fighting draw in overcast and gloomy conditions. Rahul reached his hundred off 118 balls and put on 46 runs off 50 balls with Pant, as they staved off England despite their double blows. The stand out shots from Rahul were a slapped six over extra cover and a boundary through mid-on off Stokes' bowling.